Yes! We were fortunate enough to have three days on the beach. A friend of my in-laws owns a condo on the Atlantic coast and they have been gracious enough to lend it to us when we are out there visiting. Looks like a beautiful day not to be in the garden. Clearly, the beach was the place to be! Indeed it was, and it was two weeks out of the garden. 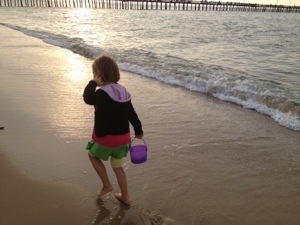 We spent three days of those two weeks in Virginia Beach. It was lovely. I always find it difficult to leave the garden in the hands of another for such a long stretch, but it always does just fine ;).